The Yankees today released a statement from Hal Steinbrenner. I’d like to thank our great fans for their support throughout the entire 2011 season. We shared a number of memorable moments, including Derek Jeter and Mariano Rivera’s historic achievements, while earning the right to play in the postseason for the sixteenth time in the last seventeen years. I personally share in our fans’ disappointment that this season has ended without a championship. That is, and always will be, our singular goal every season. I assure you that this disappointment will strengthen our resolve to field a team in 2012 that can bring a twenty-eighth championship to the Bronx. That work starts now. We played a very talented team in the Detroit Tigers and they deserve to play in the American League Championship Series. I congratulate Mike Ilitch, Dave Dombrowski, Jim Leyland and the entire Tigers organization. Their team has given the city of Detroit something to be very proud of. A few other notes from today. • Joel Sherman reported that Eric Chavez is “leaning heavily” toward retiring after this injury shortened season. If the Yankees want to give Alex Rodriguez regular DH at-bats next season, they might need another Chavez-type to play the corners, or they could trust Eduardo Nunez with a more regular role. • A lot of questions in today’s chat about Yu Darvish, who is certainly the biggest name on the international free agent market. Bob Nightengale reports that “rival teams are predicting” the Rangers will be the team to land Darvish. The Yankees would have to be convinced Darvish wouldn’t be another Kei Igawa, and by all accounts, he’s not. • TBS announced that last night’s Game 5 drew 9.72 million viewers and was the most watched LDS game in cable television history. It was the most watched LDS game on television — network or cable — since the 2005 Game 5 between the Yankees and Angels. • Baseball America’s latest minor leagues transactions say that Gustavo Molina has elected free agency. That was inevitable. Also inevitable: The Yankees finding a veteran catcher just like him to play a similar role next season. Always proud to be a Yankee fan. It's been a blast, look forward to the offseason when it starts! Even with Lee.... Phillies loss their battle with the Cardinals. With 4 "Aces" Phillies are done for the season. Talking heads got it all wrong...in a short series anything can happen. The best team doesn't necessary make it to the final dance. With that said..Fire Manual !!!! Trade Howard, Utley and Victorino for choking ASAP!!!!!!! Thanks for the new thread Mo. Bummed out last night. Today looking forward to our Yankees reaching 28 in 2012. On a personal note ,I will add you to my prayers for you to feel better. Glad to see you around Bernie. I know, I was bummed the other night also ... you wouldn't believe the things I said to Jonah! Hope to see you around and that you are well. Isn't the first step to re-sign Cashman ... did you hear anything about that? I finally sat down to watch the game, and it was the 9th inning last night ... LOL ... what a beautiful thing! 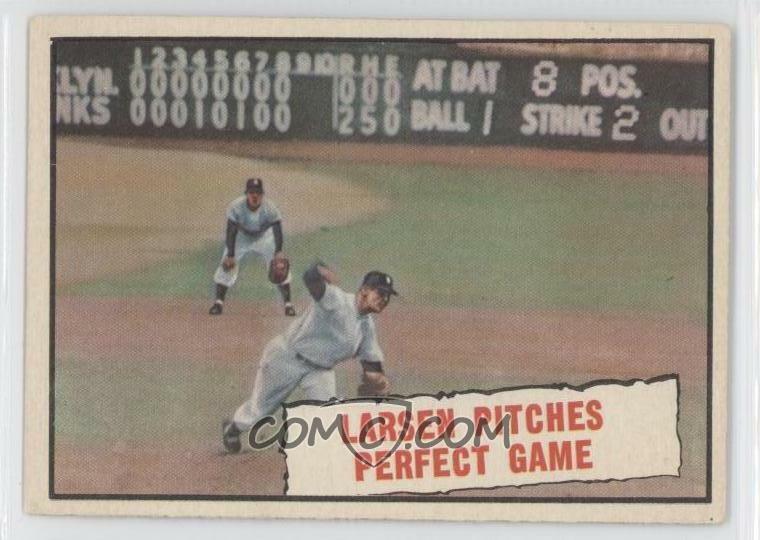 October 8, 1956- At Yankee Stadium, New York Yankees starter Don Larsen pitched the only perfect game in World Series history for a 2-0 triumph over the Brooklyn Dodgers. Sal “The Barber” Maglie, the opposing pitcher, gave up only five-Yankees hits. Mickey Mantle hits his third Home Run of the 1956 World Series. He makes a great defensive catch in centerfield to save Larsen's Perfect Game. E–None. DP–Brooklyn 2 Reese-Hodges, Hodges-Campanella-Robinson-Campanella-Robinson. 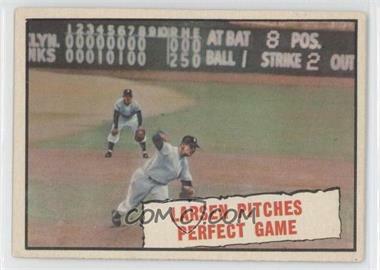 HR–New York Mantle (3,4th inning off Maglie 0 on 2 out). Team LOB–0. SH–Larsen (1,off Maglie). Team–3. U–Babe Pinelli, Hank Soar, Dusty Boggess, Larry Napp, Tom Gorman, Ed Runge. T–2:06. A–64,519. Were there missed deadline opportunities? On the night the Yankees were eliminated, they were beaten by a starting pitcher who easily could have been pitching for them. Doug Fister was traded at the deadline. He came to Detroit with reliever David Pauley for a package of four young players. He came with a miserable 3-12 record, but he also came with a 3.33 ERA, a 1.17 WHIP and a contract that had not yet reached arbitration. With the Tigers, Fister was a difference maker, going 8-1 with a 1.79 ERA. Should he have been with the Yankees? It’s easy to look back and say, yes. Fister is still just 27 years old, and although he’s not an overpowering pitcher, he doesn’t walk many guys and he’s been a reliable starter for two and a half seasons now. It’s also easy to look back and remember what the Yankees were on July 31. They were a team with too many middle-of-the-rotation starters as it was. They needed a clear upgrade, and although Fister looks like that today, back in July he was a guy with a 4.40 ERA on the road and a 3.42 at spacious Safeco Field. He was a nice pitcher, but not one who was clearly better than Ivan Nova or Freddy Garcia or the freshly healthy Phil Hughes or the still-pitching-well Bartolo Colon. Ubaldo Jimenez looked like a real upgrade, but he went to Cleveland and pitched to a 5.10 ERA in the last two months. His worst starts were against — who else? — the Detroit Tigers. Edwin Jackson was a nice addition for the Cardinals, but he fits the Fister profile as a not-a-sure-thing addition for the Yankees. Hunter Pence helped balance the Phillies lineup, but the Yankees had no pressing need in the outfield. Francisco Rodriguez helped the Brewers advance, but the Yankees bullpen was a strength, not a weakness. Via Buster Olney, talks between the Yankees and Brian Cashman about a new contract are going smoothly, and the two sides could have a deal done as soon as next week. Both sides have expressed interest in a reunion in recent weeks, so news that talks are going well isn’t all that surprising. I wonder if Cashman will push for a little more control given how bad the ownership-driven Alex Rodriguez and Rafael Soriano contracts look, but I suspect we’ll never know. Thanks lauren, that's good news!